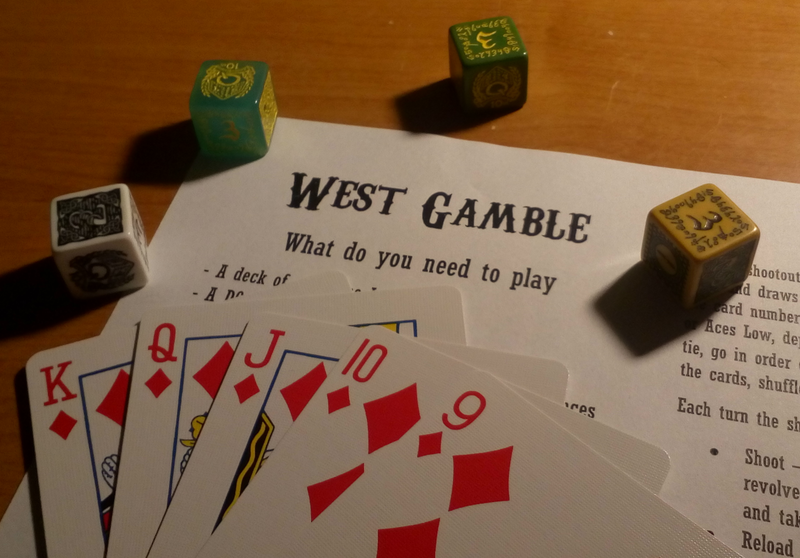 West Gamble is an easy-to-learn RPG System designed to fill wholly on a single A4 page, full of shooting hats off of peoples' heads and best played with a soundtrack by Ennio Morricone. The players become gunslingers in a Spaghetti Western setting filled with power struggles - local Sheriff fighting the bandits of the Wyatt Gang, filthy rich Oil Tycoon trying to get the Ranchers' land, and US Army trying to eradicate the Natives. The mechanic is very simple, and instead of dice uses a simple deck of playing cards, chips (preferably poker ones) and optionally D6 dice for that western saloon poker table feel. Dealer (Game Master) chooses an Ante (Difficulty Level, standard is 3), and then puts a single card on the table. The Dealer draws a card in secret, and then the Player chooses High or Low. If the Player chose correctly (e. g. they said low and the drawn card had lower value than the one on the table) or the card has the same value, the Dealer puts the card on the table and continues drawing cards and putting them down in the same manner until the Player makes a mistake. Once the Player chose wrongly, count the cards on the table. If the Player is good at the thing being tested, add one to the result. If the result is higher or equal to the Ante, the Player passes the test and successfully does the thing. Shuffle all the cards back into the deck. Also the Player can spend the Chip they have to automatically pass any test, but next time they screw up a test the bad things will become even worse for them. You can now get my RPG System for free!